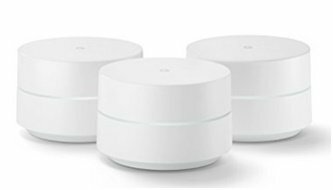 Google WiFi system is a new type of wireless router that can work in a group to provide WiFi coverage to the whole house. It replaces your single router with multiple “points,” giving you an entirely new home Wi-Fi experience, and the best part is that you can add as many points as you need at different locations in the house without affecting your Wi-Fi speed. This Wifi system uses “mesh” technology to create a single Wi-Fi network, so you always stay seamlessly connected as you move from room to room. With multiple Google Wifi points, Network Assist invisibly puts your device on the closest point and fastest connection, so you can take your video calls from the living room to the kitchen without losing signal. There are two Wi-Fi bands: 2.4GHz (slower, but longer range) and 5 GHz (faster, but shorter range). Google Wifi automatically connects your device to the band that will be fastest based on your location. Network Assist ensures Wifi points are using the clearest channels to connect to one another, and to your devices. You need a mobile device running Android 4.0+ or iOS 8+ in order to install and use a simple app to set up this WiFi point and allow you to see what's connected, prioritize devices, and pause the Wi-Fi on kids' devices. A single Wi-Fi point covers up to 1,500 sq. ft., a set of three covers homes up to 4,500 sq. ft. Wi-Fi points work together so you can add more if you need additional coverage. This works. It was a no brainer to set up. If your looking for heavy tech details, this not the product for you. If you have a house that has dead spots and you want to make your life easier, this is probably for you. I connected the Router directly to my U-verse gateway. I then created a bogus network name for the Google WIFI router. I added the the other two routers and played around with the position of the routers. I was very surprised, but even getting the router up a few feet made a huge difference in signal strength, so be mindful of placement. Then I let it sit overnight and allowed google to do all the updates. The next day, I turned off the att U-verse wifi (on the gateway) (net gear has instructions and it was easy) and then changed the bogus name to the exact name and password of the U-verse gateway. It worked perfectly. The sonos would not kick on until I plugged in an Ethernet, to one of the google wifi routers. This is good because it helped me elimate some gear. I would recommend this product. I like that it works with the google onhub, is simple to use and now it only needs to intergrate with Alexa to be perfect. 3 story house on a hill, wifi shadows everywhere. Extenders have provided minor improvements at the almost universal expense of performance. "Mesh" sounded like the solution, but early options lacked the type of consistency I wanted. For what it does, this is a really good product.However, it insists that it be the only router in a network and that virtually every device in the network be wireless. It can be forced to handle wired devices but does not allow the user the option of using their own router for DHCP/DNS assignments. I have a mix of wired and wireless devices, though and I wanted a wireless AP and not a router. Because the GWF has very limited configuration options the user is not able to make this a wireless AP. In addition, the GWF only assigns a single "hardwired" private address subnet i.e. 192.168.86.1/24 and does not allow the user to assign their own private addresses in any other ranges. Due to these limitations I can only give an "okay" rating. Even if I needed the wireless mesh feature I probably wouldn't use this device because of its limited configuration options. It is very disappointing that Google seems to only want to cater to the average user and ignores the more advanced users that might be interested in this product. I love the app that goes along with this product. It is easy to run diagnostics, share the password with guests and prioritize devices. However, I consistently experienced a lag time in my devices connecting to the wifi (i.e. opening an app on my phone would just clock) despite running having a strong signal in that location when running the diagnostics. I was very excited for this product but in the end it did not meet expectations. Ok, I seldom write reviews, but I feel compelled to say that this is the finest piece of electronics I have ever purchased. It's not for Geeks, it's for people who just want broader wifi coverage without any of the usual hassles associated with routers/modems etc. The product is beautifully packaged, extremely simple and to put it simply--WORKS. There are virtually no instructions (none required) because the phone app takes you step by step through the install. It personifies the definition of minimalist, this is what Apple use to do. Well done Google! Note: I installed this mesh wifi with a U-verse system and have absolutely no compatibility issues whatsoever. Return to top of "Google WiFi System for Whole Home Coverage"! !